Stuffed chicken has always been an item that sells extremely quickly when we offer it as a new menu special. While we have served stuffed chicken here countless times before, we decided to bring it back this week with a new twist that is slightly different from our normal fare. Our chefs stuff our seasoned chicken breast with prosciutto and brie. Prosciutto is an Italian style dry-cured ham that is thinly sliced with a slightly salty taste to it. To offset this, we serve it with a french brie - a soft cow's milk cheese - that lends the dish a rich, savory flavor. 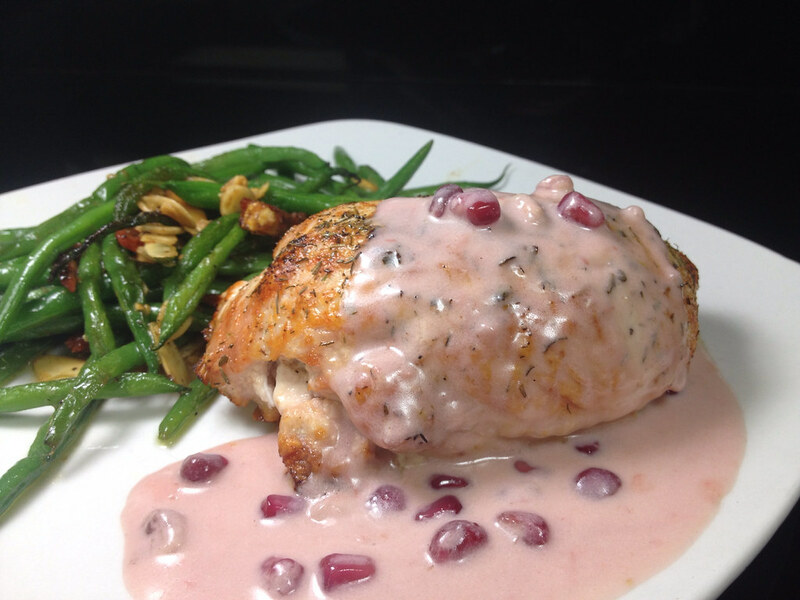 Baked to a perfect golden brown, the chicken is then topped with our housemade pomegranate champagne cream sauce. This light, yet decadent sauce is the perfect complement to tie this dish together. The sweet, creamy sauce (made with real pomegranate) balances out the salty, creamy stuffing of the chicken without letting the dish get dried out. For 14.75, the stuffed chicken breast is served with your choice of sides. A glass of red wine can be the perfect pairing to this dish... and the cheapest way to transport your taste buds to the cuisine of northern France! This sounds wonderful! I hope to be in soon to try it!